A Block of the Month, aka BOM in quiltspeak, is a great opportunity to explore new techniques, build new skills, dive into quilting, sew together, make friends, and connect with the quilting community. It is also a way to keep your project on track! 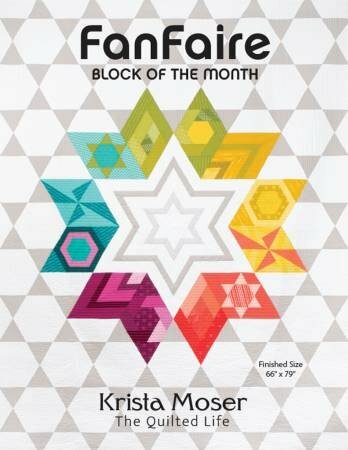 FanFaire, Block of the Month, is a six-month block of the month with each block made twice for a total of twelve blocks. Every block teaches you a new way to use the Creative Grids 60 Degree Diamond Ruler. Cut a combination of diamonds, triangles, hexagons, parallelograms and trapezoids to create this fun quilt, and all with one ruler! This quilt goes together fast and is oh so striking! We will meet for a total of 7 times, 6 classes to do the 6 blocks and the 7th class to put them together with the background. The class includes the pattern, ruler and all 7 sessions and if you finish the quilt in 2019, we will give you 20% off on your long arm quilting.